It’s amazing how a work can be considered legendary (according to this collection’s cover) and obscure at the same time. Paul Chadwick‘s Concrete is a character who has been appearing in publication since I was born (in 1986), yet I only heard of from a friend I met in a History of Sequential Art class in 2009 – while discussing lesser known creations that deserved wider readership. On his advice, I saved an ebay search and managed to get all 6 volumes of this lovely Dark Horse reprint series. Last night, I finally set aside a moment to read the first book, Depths. When I woke up, I was greeted with the serendipitous news (published two days ago in an excellent interview by Guerrilla Geek) that there would soon be another Concrete series running. With only one volume of exposure, it was still the most exciting thing I’ve read all day. I admit, I’m already a fan. I’m not particular surprised. Concrete is exactly the kind of comic I enjoy – a deconstruction of the superhero, a lovingly crafted character study with semi-autobiographical elements, an adventure story, and something more slow, subtle, at times mesmerizing. This volume contains the creation of a character immediately familiar, a man monster with obvious parallels to mainstream favorites like The Thing, but also closer to actual readers in his world and motivations. From the first page, we’re introduced to one of the main supporting cast, aspiring writer Larry. Indirectly, we’re also introduced to Concrete himself, through branded clothing and shopping bags carried by people walking by – he’s obviously famous, a celebrity fad of some sort. This early sequence sets the mood wonderfully – Terry has an awkward interaction with a potential date and an ex-roommate. He answers a want ad for a typist, and wanders off, his story intersecting with Concrete’s apartment through their shared listening of a radio segment on the stone man. Concrete lets drop that his civilian career was as a speechwriter, introducing another of the main players, his senator friend and mentor. This is page four, and while packed with information, it flows much more organically than my description, giving away much without tilting any hands. While it’s the building story that will grab you, I saw something extremely profound here – everyone is writing. Our three main characters are introduced, one is an ex-speechwriter, the other a hopeful novelist now acting as a reporter for the first, and the third we soon learn is a biologist journaling her own reports about Concrete’s unique body. This desire to create, record, tell your story, tie your story to great events around you – the human desire for some kind of meaning in life – it’s a constant theme here, one perhaps easy to overlook alongside the more graphically expressed stories of survival, of coping when separated from those around you by your own form. It’s obvious that Concrete, and to an extent every character, is an extension of Chadwick himself. 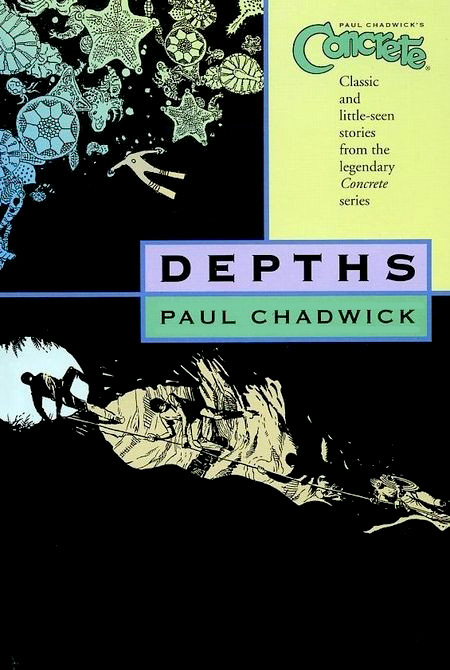 Like any enjoyable fictional being, the exact boundaries are never clear (where Concrete ends and Chadwick begins, what memories they share, how much is metaphor and how much based on some kind of real life event.) But by the end of the volume some shared memories and motivations are undeniable – the last story, “Vagabond” is actually an autobiographical short, but it flows almost seamlessly from the Concrete content – up until the last page, I didn’t quite realize that this wasn’t a story of Concrete’s past, but the author’s. There is a shared respect and admiration (between the author and his creation) for the adventurous writers of ages past. Both for the prestige that comes with exploring the unknown and pushing limits, but also the opportunity for reverie and self discovery that such journeys bring. There are things a man will discover about himself when on the edge, when faced with mortality. And for Concrete, now existing in a near indestructible rock-like shell, the journeys are extreme and far reaching – he is a fan, for example, of long distance (like an ocean!) swimming and deep sea diving, though his heavily form makes it extremely dangerous to him. Of course, some of the book’s drama comes in the form of danger to his companions, easily at greater risk due to their squishy bodies – leaving some room for super-style-heroics. But this isn’t a story overly concerned with spandex origins and super powered villains. Concrete’s foes are familiar, mundane – jealousy, greed, ego, fear, bad decisions, childhood trauma. In a slight twist, one of his senses, vision, has been increased drastically. Though perhaps it’s simply an extension of the author’s own existence as a visual person, it may also be the motivation for our protagonist to keep moving forward, resist becoming a rock in truth. He can see what’s out there, see what’s coming. 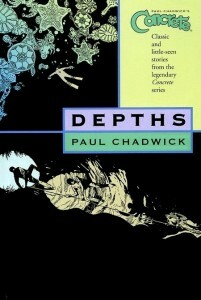 Having mentioned Chadwick’s visual nature, we must discuss the beautiful art in this book. Like many independent comics, the work here was originally published in Black and White, just as it’s found in this reprint. We’ve mentioned that some of the colorless Showcase and Essentials collections fare rather well, but this book is a shining example of what can be accomplished with ink and just the barest minimum of gray tones. Many pages, especially those featuring underwater exploration, have spectacular displays of lovingly detailed life, acutely conveying the sense of wonder that can accompany exploration of the unknown. Every character is full of life and expression, recognizable and iconic. Terry, bearded and bespectacled, reminds me of myself and many other aspiring creatives. Maureen, lovely and sharp, is a stand in for my fiance and every beautiful, smart woman. Concrete is all of us – especially when we feel uncomfortable or apart from humanity. Each of them is uniquely themselves. It’s a strength of the medium. With the right amount of lines, not too many, not too few, characters are recognizable in every panel, their emotions and history plain on their faces, but still imprintable. On related note, I think many readers often find it necessary to identify superheroes by hair color when out of costume – without color here, self-projection becomes easier and Chadwick’s recognizable characters are even more impressive. The art flows with the text. Shifting perspectives, dynamic layouts, plenty of small references to art history and sides jokes flying by in the background. It all comes together to create stories capable of evoking eerie horror, humor dark and light, tenderness, laugh out loud moments, and disgust. A human story, in every aspect. 5 out of 5. A story about a human trapped in a strange body, moved to adventure. And a story about the human desire to have their story told, to be known and understood. A subtle, intriguing work, with too many layers to discuss in one sitting. Considering that these books seem to be constantly available new and lightly used for about 2 dollars each on Amazon, you have little excuse for not giving Concrete a try. I’m sorry that I took so long to get to it myself. For Concrete, I’d say this book is essential – start here and read through the Dark Horse editions by the numbers on the spine. This is the first book in the Concrete series. The obvious next step is Concrete Vol. 2: Heights. I didn’t think that this book was too much, but I’ve heard that Chadwick can get a little heavy and/or preachy in this series, but only enough that it’s sometimes advisable to not read all the books back to back. I unfortunately don’t have time to do that anyway but I’ll let you know if I feel that’s the case as I read through the series. Excellent review! This beautiful work deserves a high-quality, large-format reprint. Concrete is also my favourite series, and it’s probably the best use of the comic book medium I’ve ever seen. You what is also amazing? Mainframe entertainment, who did the TV show “Reboot,” once worked on some FX tests for a pilot which was never finished. Whoa, weird! Thanks for bringing that clip to my attention (I went ahead and embedded it right in your comment.) Strange take on it, feels much more ongoing plot oriented. But I guess a tv test would feel that way. It’s definitely a work that’s so tied to the medium, it would be interesting how a film or tv remake would handle it. Probably different storytelling techniques entirely. I’m glad that you enjoyed the interview, and thanks for linking back! It was a humbling experience to speak with Paul, and he was very kind. This is a fantastic review! I am excited to see what you think about the rest of the books! I’ve subscribed to your site via rss, so you may see more of me in your comments section. As for the rest of the Concrete books, hopefully I can get to them sooner rather than later, but it may take a while for me to get the reviews up – I’m currently reviewing my way through the entire DC universe and this volume is one of those “other” reviews I alternate with so as to not go overboard on the DC stuff. I’m trying to mix those up a fair amount, so it may be a bit before Concrete comes up again. Wow, this sounds great. Thanks for introducing us/me to this title. I had never heard of it before, but based on this review, I think I’m going to give it a go. No problem! It’s definitely that kind of book – the one that seems too good to be unknown. I had scattered older issues and collections, but when the latest collected series came out I snapped them up in a heartbeat. Yes, can get preachy, and has a tendency to feel a little dated, especially in the Hollywood-related stories with the name-dropping, but damn what a beautiful series. Plus the extra stuff…the Sky Full of Heads and the Horrors stories are loads of fun. Actually, upon reading that interview, I was struck by the fact Chadwick’s working on a DC pulp series with Harlan Ellison! Holy cow!! I did see that! It’s amazing how Ellison just seems to keep on kicking it out. Magnificent points right here. Now i’m content to visit your submit. Thank you so much a great deal exactly what looking in front to touch an individual. Will you you should fall us a e-mail? Amaze, excellent website framework! The best way extensive are you blogging and site-building for? you create writing a blog start looking easy. The general glance of the website is terrific, not to say the material materials!